Time is running out to hold space on this amazing winter adventure in the Alps of Austria and France! Skiers and non-skiers welcome - miles of groomed walking trails available. Join trip leader and long-time world traveler Patti Polinsky for a potpourri of life-list experiences! This trip promises lots of sun and spectacular scenery with few tourists. First tour the ancient walled cities of Munich and Geneva, as well as Regensburg, a UNESCO World Heritage site on the Danube. Then travel to Sölden, Austria where you will have five days to ski or walk in an area deep in the high alps served by 36 lifts, including some for glacier skiing. Walkers can ride lifts to the tops of all the mountains and walk on safe groomed walking trails. Then travel through lovely Lucerne, Switzerland to Les Carroz, France. 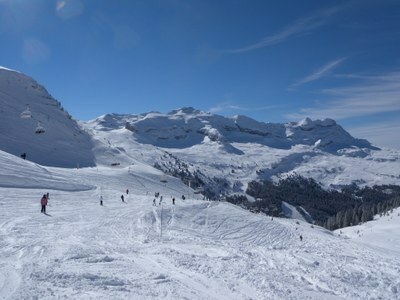 With 68 ski lifts of groomed and un-groomed runs, the Grand Massif at Les Carroz links 6 resorts including Flaine. Spend 5 more days skiing or winter-walking this vast and gorgeous terrain. Walk in the village of Les Carroz and relax over a pot of Vin Chaud at a streetside shop. End the trip with a day in lovely Geneva, Switzerland. Sign up soon, as precious lodge space at these fabulous winter resort properties must be booked this month for the trip to go!